Nothing inspires wanderlust like getting engrossed in a novel about traveling to a foreign land and the adventures that ensue. 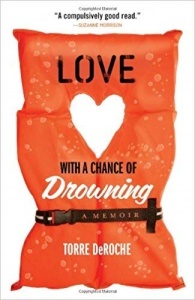 You can lose yourself in stories of love, heartbreak, redemption and self-discovery whether your traveling abroad or back home planning your next adventure. We have been traveling on and off for over 7 years, and along the way we have taken a lot of long flights, train trips, and bus rides. We always make sure we have a good travel book tucked into our bag to get us through the journey. Here is our list of the 16 best travel books that have inspired our trips around the globe! 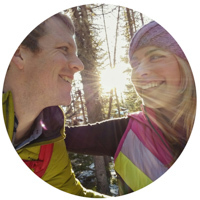 We hope that they inspire you to start planning your own adventure! Anthony Bourdain changed the way the world thinks about food. He taught us to embrace all of the strange and unique cuisines across the globe and that some of the best meals are enjoyed at a tiny plastic table down a random alleyway. 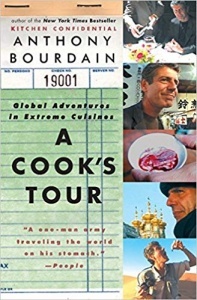 A Cook’s Tour recounts Bourdain’s dining adventures across Portugal, France, Vietnam, Russia, Morocco, Japan, Cambodia, Mexico, and Spain. He eats a still-beating cobra heart in Hanoi (we’ve done this too! ), samples half-formed duck embryos – otherwise known as balut – in Cambodia (check! ), and enjoys a tagine in Morocco (been there too!). Bourdain is a great storyteller, and by the end of this book you’ll be both hungry and eager to plan your next trip. 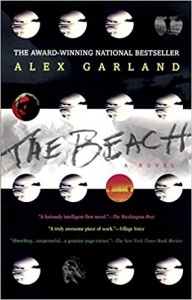 If you’ve done a bit of travelling and can’t seem to get “off-the-beaten-path” then try giving Alex Garland’s The Beach a read. Richard is a British backpacker who is disillusioned with the well-trodden tourist circuit of Southeast Asia. While staying in a cheap hotel on Khao San Road in Bangkok he is given a mysterious map to a beautiful beach, unspoiled by tourism, hidden in the Gulf of Thailand. 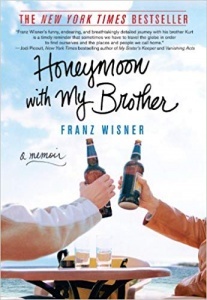 He befriends a French couple, Françoise and Étienne, and together they set off to find the secret beach. It’s a tale of paradise found (and lost) with plenty of adventure, romance, betrayal, and cannabis. 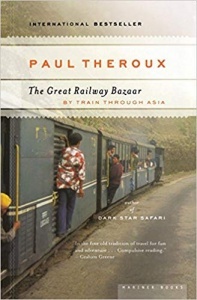 It’s truly one of the best travel books out there and a required reading for anyone headed to Thailand! 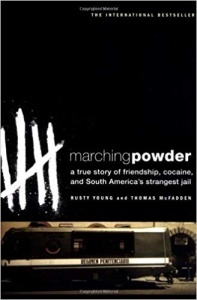 Although Marching Powder was written by Rusty Young it is really the story of Thomas McFadden, a British drug trafficker who was caught in Bolivia and imprisoned in Bolivia’s San Pedro prison. San Pedro turns out not to be your typical prison. Inside it’s walls you must pay rent for your jail cell and imprisoned drug lords are joined by their wives and children who enter and leave the prison freely. There is also an onsite cocaine manufacturing operation and a small bribe can get you out of (or into) the prison for a day. Thomas begins running tours of the bizarre prison and they become a staple of the South American backpacker circuit. When Rusty hears about the tours he signs up for a night in the prison. He winds up staying for 3 months in order to document Thomas’ story and life in San Pedro. We actually tried to visit San Pedro prison when we were in La Paz, but by that time the Bolivian government had cracked down on the illegal tours. 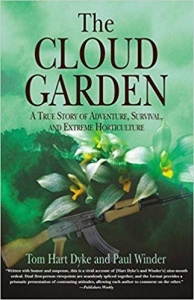 The Cloud Garden tells the story of a fearless young backpacker, Paul, and an impetuous botanist, Tom. Together they decide to attempt a crossing of the impenetrable stretch of swamp and jungle between Panama and Colombia known as The Darién Gap. This no man’s land is also full of guerrillas (not to be confused with gorillas) and drug smugglers. It’s not exactly the kind of place you want to go on vacation but Paul is hunting for adventure, and Tom is hunting for orchids. Unfortunately, just a short ways from the Colombian border they are captured by a paramilitary group and held against their will for 9-months. Their tale is chock full of suspense, wit, and even a bit of Stockholm syndrome. We are often told by friends and family not to go somewhere because it is too dangerous. For the most part we go anyways and discover friendly people and fun adventures. But this travel novel is an example is what happens when you push your luck just a little too far! 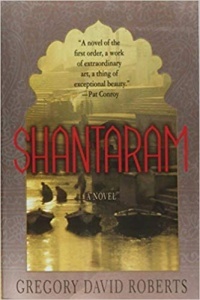 Shantaram is an epic saga of loss, hope, faith, and redemption. 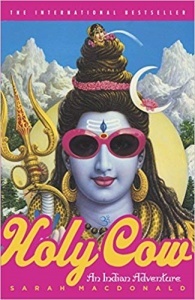 The protagonist is a convicted Australian bank robber who escapes prison and flees to Mumbai, India (called ‘Bombay’ at the time) to build a new life. Along the way he works as a slum doctor, a drug dealer, passport forger, weapons smuggler, and Bollywood actor. While some of the events mirror the author’s life, much of the story is obviously fiction or at least significantly embellished. It’s a beautiful read full of gang fights, romance, and impossibly heroic moments. A bit like the main character in your own Bollywood movie. While many of our book recommendations are quick reads, Shantaram is almost 1,000 pages. It’s the perfect travel novel if you have an extremely long bus ride or flight ahead of you. 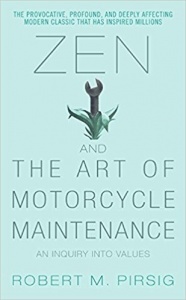 Zen and the Art of Motorcycle Maintenance is much more than just a travel book. It tells the story of a man and his son on a cross country motorcycle trip from Minnesota to California. The book deviates from the main storyline quite often to delve into philosophical pondering (which is the real focus of the book). 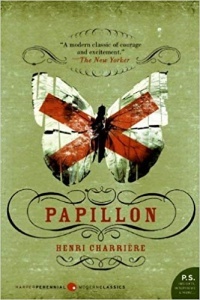 Papillon is the “autobiographical” story of Henri Charrière, a French safecracker who is wrongly convicted of murder and sentenced to a life of hard labor on the penal colony of Devil’s Island (French Guiana). The ensuing tale spans 14 years and involves numerous jailbreak attempts – some successful, some not. There is a question as to how much of the novel is true with some critics claiming it is about 90% fiction. Regardless, Charrière is a great storyteller and the book became an immediate success upon its release in 1969. It has since been translated into 21 languages and made into a move three times. You’ve probably had a few too many drinks and made a ridiculous bet with your friends before. And you probably woke up the next morning with a hazy memory of the terms of your silly bet and never actually followed through with it. 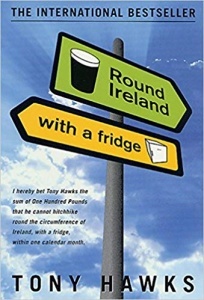 In the book Round Ireland with a Fridge, Tony bets a friend that he can hitchhike around the circumference of Ireland with a refrigerator in one month. He realizes the foolishness of this claim when he wakes up hungover the next morning. But rather than take the easy way out, he decides to give it his best shot. So with his trusty mini-fridge in tow, he sticks out his thumb and heads off on an adventure that turns him into a national hero. It’s a hilarious tale that will have you believing in the kindness of strangers and the luck of the Irish! Warren Fellows was a drug smuggler who trafficked heroin from Thailand to Australia and got caught. This book is not meant to proclaim his innocence. In fact, Fellows makes it clear that he was guilty (but mainly unlucky). 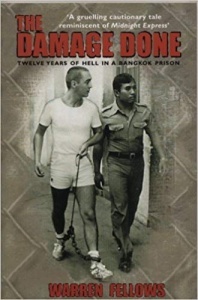 Fellows is given a life sentence in Bangkok’s notorious Bangkwang prison. His account of the living conditions and punishment that he endured for over a decade makes prisons in the USA look like 5-star hotels. 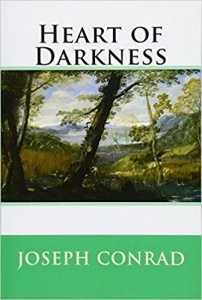 Heart of Darkness was written over a century ago but still remains a fascinating read. It’s the tale of Charles Marlow, a riverboat captain and ivory transporter obsessed with the “blank places on the earth”. Otherwise known as those areas that are unmapped and uncivilized. He journeys up the Congo River in Africa in search of the mysterious ivory trader, Krutz. 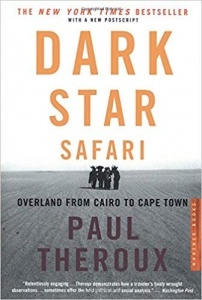 Marlow’s trip into the heart of the African continent is full of vivid imagery and shines an uncomfortable light on the practice of imperialism in the 19th century. While the story takes place in Africa, this book was the inspiration for the cult classic movie Apocalypse Now set in Vietnam (it’s also the namesake for one of the best new breweries in Saigon). Whether you’re headed to Africa or Southeast Asia, this is a classic quick read. A Walk in the Woods recounts Bill Bryson’s attempt to hike the entire 2,100 miles of America’s Appalachian Trail with his overweight, chain smoking friend, Stephen Katz. Along the way they meet a host of interesting thru-hikers and develop a begrudging appreciation for the beautiful and fragile wilderness of the United States. 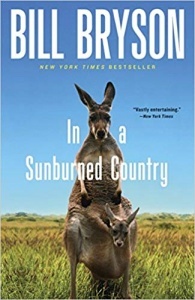 Bryson has a great sense of humor and all of his books will make you chuckle. Many people prefer his travel novel about Australia, In a Sunburned Country, but I have a soft spot in my heart for A Walk in the Woods. Perhaps because I grew up in East Tennessee, just 20 miles from the Appalachian Trail. 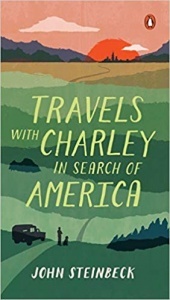 In Travels with Charley John Steinbeck recounts his 1960’s road trip around the United States with his French Poodle, Charley. Steinbeck was nearing the end of his life and wanted to see America one last time. 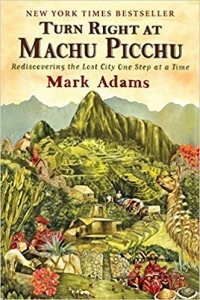 So he bought a GMC pickup truck, outfitted it with a camper named Rocinante (after Don Quixote’s horse), and set off on his epic journey to rediscover the country he spent his life writing about. It’s best to not take the story as an actual autobiography. His older son later remarked that “Steinbeck was at heart a novelist” who would never let the truth get in the way of a good story. And it is a great story. 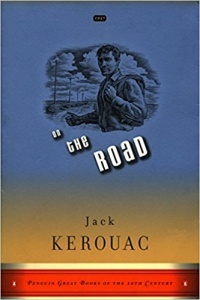 In fact it’s one of the best travel books for anyone planning an American road trip. 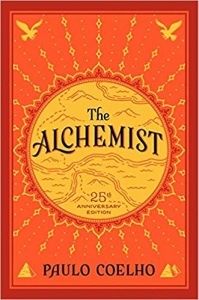 Recommending The Alchemist may be a bit cliché, but it’s one of best selling travel books in the world for good reason. The Alchemist is the quintessential traveler’s tale of learning to listen to your heart and following your dreams. Santiago is a young Andalusian shepherd who decides to give up his flock of sheep and journey to Africa in pursuit of his personal “treasure” which he believes is at the Pyramids. Along the way he loses everything he owns (a few times), meets a king, falls in love, and much more. The Alchemist is a quick, easy read and is a great place to start if you’re looking for a little travel inspiration. 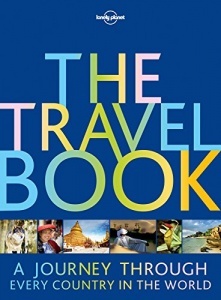 At approximately 450 pages, the Travel Book is huge and heavy. So you certainly wouldn’t want to bring it along on your trip. But it’s the perfect coffee table book to help you get inspired to plan your next exotic vacation. If you prefer visiting obscure destinations over staying in 5-star hotels, Atlas Obscura is the perfect travel book for you! “Inspiring equal parts wonder and wanderlust”, this oddball travel book details 700 of the most bizarre sites around the world. 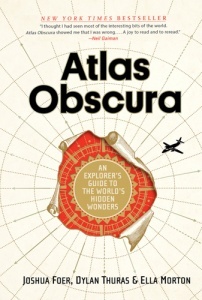 It’s another book that is better suited for the coffee table at home than your suitcase, but flipping through the Atlas Obscura will definitely make even the most content homebody curious about visiting some of these off-the-beaten-path adventures. 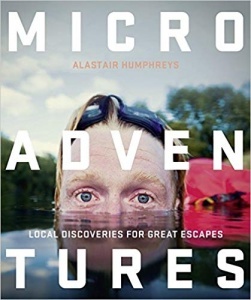 Alastair offers a fresh take on the concepts of travel and adventure in his book Microadventures. He believes that you can take the spirit of a great big adventure and squeeze it into a short time period with a small budget. He challenges everyone to get out of their comfort zone, even if it’s just spending the weekend camped on a nearby hillside or taking a swim in a lake closeby. You don’t have to book a plane ticket to experience adventure, sometimes it’s waiting for you right in your own backyard! 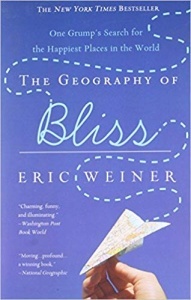 What’s your favorite travel book? Tell us in the comments so we can add it to our list! AB was an incredible story teller. I gain inspiration from my fellow NJ-ite. We both hit the road to see the world and I am no foodie but definitely vibed with the guy and his no nonsense style. Tweeted for you. I love to get my history and travel inspiration from books. The Beach sounds interesting if you are visiting Thailand. Shantaram sounds like it might be good for a long trip with lots of down time. A Walk In The Woods might be interesting for the humour. I am less intrigued with foreign prisons than you so many of the books I would pass on. A good selection. Everyone should find something that will interest them. I love reading books but for me its getting the time to do so! I have to admit I never heard of any of these books so gonna try and check them out. Thanks for the tips. Thanks for the book recs 🙂 So many of these I haven’t read yet! 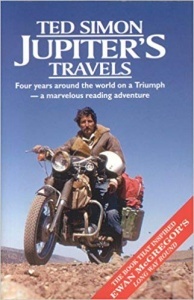 I love a good travel book, especially for long train, plane or bus journeys. Do you guys have Kindles, or do you bring books along? I’m always curious what other travelers do. That is a wonderfully compiled up list. I have just read out of all these (The Beach, and Alchemist) and now surely take time to read all of these – I mean one by one. 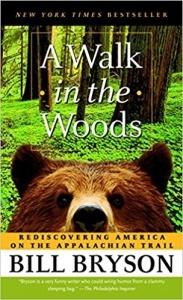 I have read just three on your list: A Walk in the Woods: Rediscovering America on the Appalachian Trail, Travels with Charley: In Search of America, and The Alchemist. Would you believe my writing has gotten in the way of my reading. 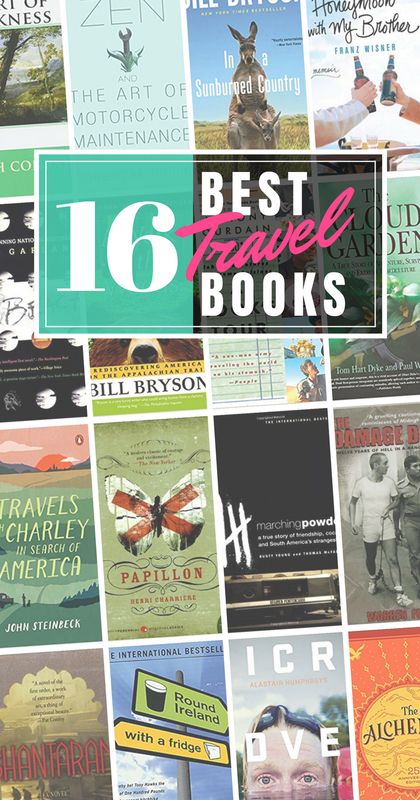 There are so many good travel books out there! I love the concept of this post! I was actually thinking of creating something similar. Great recommendations! If I could add a book to the list, it would be “The Lost Girls.” A true story of 3 friends’ round the world trip! It almost made me go on a yoga retreat to India 🙂 Maybe I still will…. These are amazing books on the list that I noted everything except for the Alchemist as I’ve been reading that a lot of times already, it’s my favorite travel book that’s why. Although I am passionate about travel books, I’ve never heard the rest of the list so this is a good information for me. I will definitely start with “A Cook’s Tour” by Anthony Bourdain, that got me interested more. Being passionate about books from childhood, books have always been the wings that fueled my travel imagination. Many of the places that I visit today are places that I have already visited through the books that I have read. This is an awesome list of books. I have read quite a few of them. my all time favourites are Papillon and The Alchemist.